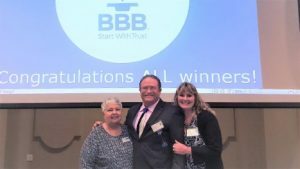 On Wednesday May 10th our Legal Eagle Team attended the Greater Houston BBB Excellence Awards at Bayou City Event Center and received our 9th BBB Award of Distinction. Businesses from Harris and 11 other counties surrounding Houston are vetted to decide the winners. 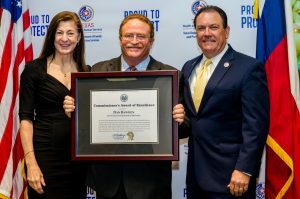 “We are thrilled to be chosen for this honor again this year!” said Dan Bawden, President and CEO of Legal Eagle Contractors (see photo). On Friday May 12th, Legal Eagle was honored by Houston Adult & Family Protective Services (AFPS) for a charity project it took on early this Spring. The project involved helping a 96-year-old World War II veteran named “Mr. Buzz Cotton”. A home visitation by AFPS revealed Mr. Cotton was living in very poor conditions. A retired home-builder, he built a 20’ x 25’ home by himself in the 1980’s out of scrap lumber and leftover construction materials. The home had a corrugated tin roof that was constantly leaking, damaging the ceilings and insulation, and creating dangerously moldy environment. Every year Mr. Cotton would place a 30’ tall extension ladder against his home, climb 25 feet up to the roof and stretch a large tarp over the old tarps from prior years, to stall the water intrusion into his home. “We are a small company but we believe our highest calling is to be of service to others using our construction skills and resources. We look for opportunities and help out where we can. Mr. Cotton is certainly a deserving individual. It was no coincidence God connected us through AFPS”, said Bawden.